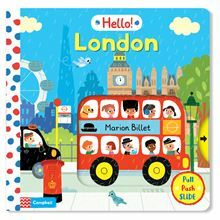 Hello London is a brilliant board book by Marion Billet published by Campbell Books, an imprint of Pan Macmillan. The book is a large size with plenty of interactive features for toddlers to explore, and it really kept my boys Mr T and Mr R (age 4 and 2) engaged and entertained. 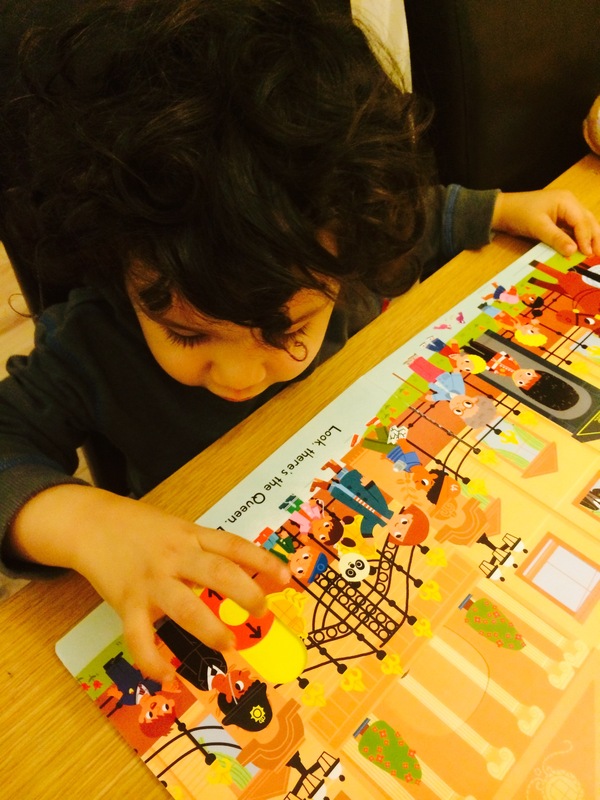 If you are looking for toddler books about London, then this is definitely a great option! Hello London includes 4 double page spreads with different London scenes. Each one has an interactive element and bright detailed pictures for the children to enjoy. The text is simple with a maximum of just a couple of sentences per page, so it is ideal for younger reader with shorter attention spans. There is also rhyme to grab the children’s attention when listening. 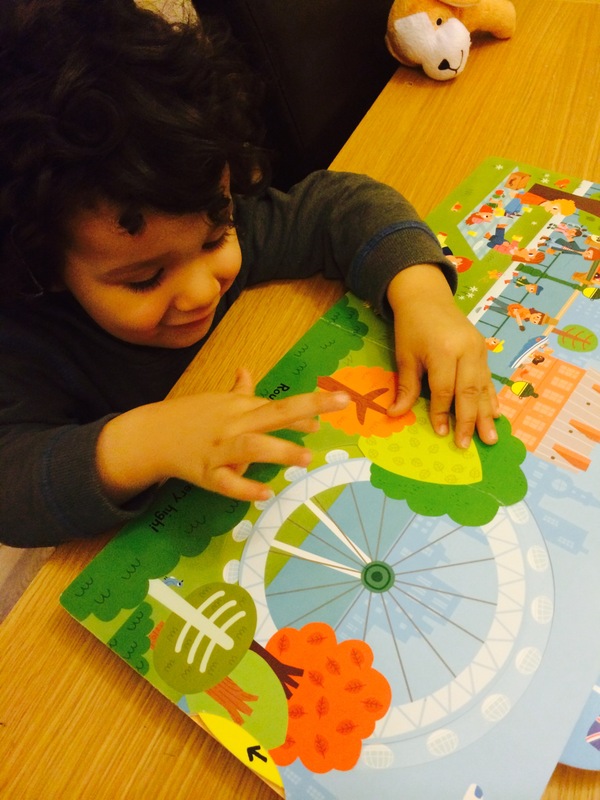 Even very young toddlers would enjoy the rhyme and simple story of this book, but the interactive elements and inciting London scenes mean that there is plenty for older toddlers to enjoy too. I definitely think that this is a board book which can offer more longevity than most board books could, and it is really lovely. 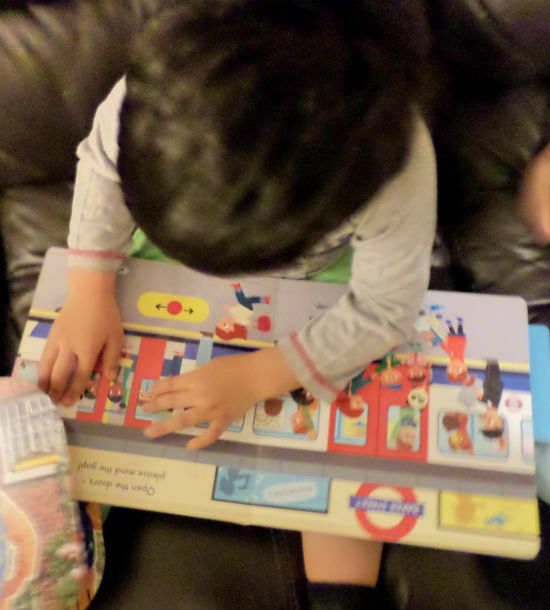 London transport is one of the topics which all of my boys seem to love, particularly my younger boys age 2 and 4. They are very keen on transport anyway, but perhaps the familiarity of the London ones appeals to them even more, as we are from London. Or it could be the striking bright red colours of the London bus and tube! Either way, they absolutely love it and they do seem to really gravitate towards any pictures or toys featuring these vehicles so this book was a real hit with them. The pages are all very thick and even the moving parts of the book are pretty sturdy. It is not a lift the flap book where you might worry about toddlers accidently ripping some of the flaps if they are rough with the book while reading. This book would be great for any young child coming on a trip to London, to help them learn about their trip and give them plenty to talk about. It’s also great for any young children like mine who live in London, to learn about their home city and feel proud of where they live. Mr R (2) in particular will sit with this book for ages and really enjoy looking at and exploring all of the pictures. He loves books, and this one has quickly became a real favourite. I would definitely recommend it for children of a similar age group. If you would like to win a copy, head over to Over40andamumtoone where Mary is running a competition with 5 chances to win! Click here to enter. Alternatively, the book is available from Amazon and all good book stores. « Kids After School Activities » Your Valentines Day Questions Answered! Donna recently posted…I’m going to The Baby Show! This looks like a lovely book, a really nice way to teach little ones about the sites of London. That looks like a lovely, bright and colourful book. We’ve really loved this book too, it’s the perfect toddler read. Thanks for the link Anna – it’s a lovely book isn’t it. We’ll be rading up again before we come down again this week! The illustrations in this book look really appealing – I’d really like to read it now and see which parts of London are included.